The University of New Mexico’s Solar Splash team was pleased with its performance in its first year competing in the national solar boat competition. Solar Splash is an international intercollegiate solar / electric boat regatta that takes place over five days.The contest was held June 15-19 in Dayton, Ohio. UNM's team placed fourth overall, second place in slalom, and were recognized as the highest-scoring rookie team. They also received a special sportsmanship award for their willingness to help out other teams. Fifteen teams entered the competition this year, and 13 actually had boats ready in time for the event. Peter Vorobieff, professor of mechanical engineering and faculty advisor to the team, said the team’s performance was due largely to one thing. Vorobieff noted that the team had no major mechanical malfunctions, despite the fact the UNM boat was built for considerably less than the other competing teams’ boats. He said they were outspent around 10:1, with the UNM boat costing less than $10,000 to build. Vorobieff said the team was helped greatly by being able to start the project within the framework of the senior design class developed by Professor John Wood in the Department of Mechanical Engineering. The senior design class taught the students to consider multiple design alternatives, to evaluate their options using iSuccess criteria accepted in industry, along with learning how to market the design, figuring out the cost of materials, and many other aspects. The team also felt it was an advantage to build their own solar array instead of use manufactured cells, with the team having to solder individual cells together. The Solar Splash rules allow student-built arrays more surface area and power than premade ones. The team of eight students (seven mechanical engineers and one electrical engineer) has been working on the project since last fall, said Lucca Henrion, team lead who recently received his bachelor’s degree in mechanical engineering. 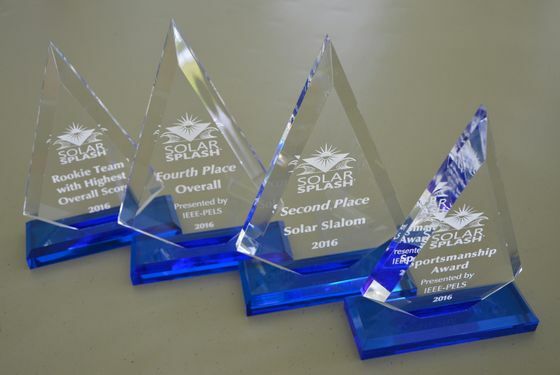 The UNM Solar Splash team garnered several awards at their first year in competition. Henrion said the experience taught him a lot. Vorobieff said he would like to compete with a team in next year’s race. The goal is to grow the support and sponsorship of the team to enable it to make improvements on the boat. The team has a variety of sponsors, including Sandia National Laboratories, UNM, ASME, IEEE and Sunpower by Positive Energy Solar. The team secured build space for the semester at the Mesa del Sol facility south of campus. The space was donated by Steve Chavez, CEO of SC3 International. The boat is named Jolly Roger, for Roger Koerner, who donated to the project. Koerner received a bachelor’s degree in mechanical engineering from UNM in 1968 and is retired from ExxonMobile. To make a donation to the UNM Solar Splash team, contact Betty Karlsson, senior director of development for the School of Engineering, at (505) 277-0230 or betty.karlsson@unmfund.org.